On a sunny day in Hermosa Beach, I eagerly awaited the plate of chips, steak and melted cheese coming my way. I was out with a group of friends having just played beach volleyball for an hour and I was starving for some good ol’fashioned nachos from the restaurant we stumbled upon (that I will not name). 15 minutes later the waiter put in front of me a hot plate of chips with melted cheese…but it was kind of sad. Many chips were stacked on top of each other and the bottom layer had no cheese. The “steak” that was advertised looked burnt and was obviously of very low quality. And worst of all, the nachos costed $14 and were small…a definite waste of my hard-earned cash. Unfortunately, the above experience describes a lot of nachos at restaurants. I haven’t been to a Los Angeles restaurant recently that has wowed me when it comes to nachos. And I don’t just like nachos, I am OBSESSED. Of my top 3 favorite guilty pleasures, it’s Number 2. Right above fried calamari with fresh lemon. My first priority was getting a nice piece of steak. My first priority was getting a tasty piece of meat. I decided to marinate a nice piece of flank steak with a classic carne asada sauce: lots of fresh lime juice, olive oil, fresh garlic, chopped japapenos, cumin, paprika, salt and pepper. I marinated the meat over night so it could soak up the flavors, then patted it dry before cooking it to a nice medium rare. When it cooked for a second time with the chips, it wouldn’t loss too much of its juicy flavor. To understand the above tip, think about how nachos often have ingredients that are scattered around. Ideally, you want a bite of melted cheese, steak, beans, tomatoes, cilantro and guacamole on every chip. The key is to have a thin layer of chips and then to do your best to make sure all of the ingredients are spread around as much as possible. Take your time. Tip 3: You should always add more cheese than you think. Self-explanatory. Trust me, on this one. The Night Before: In a bowl whisk together lime juice, garlic, paprika, half the jalapenos, cumin, 1 tsp salt, 1/2 tsp black pepper, and 1/2 cup olive oil. 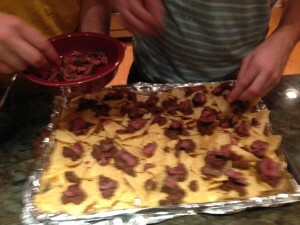 Place in a plastic bag, add steak, mix well, seal and refrigerate. One Hour Before serving: Take the steak out of the bag and pat it dry with paper towels. Let rest on a plate to get to room temperature. 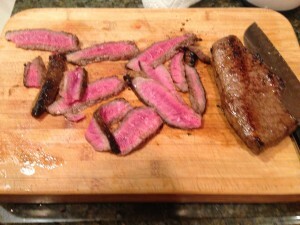 30 Minutes Before serving: In a large pan, add 2 Tbs oil over medium-high heat, then add your steak. Cook for 3 minutes, then flip and cook an additional 3 minutes. Remove to a plate. 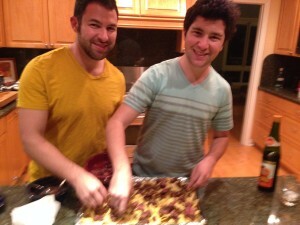 Let rest for 10 minutes, then cut into bite-size pieces. 10 Minutes Before serving: Cover a large baking pan with aluminum foil. 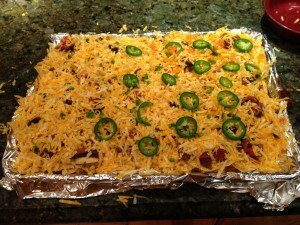 Add a single layer of chips. Spoon the beans evenly over the chips. Add steak bites all over. Cover with cheddar cheese. Add jalapenos if you’d like. 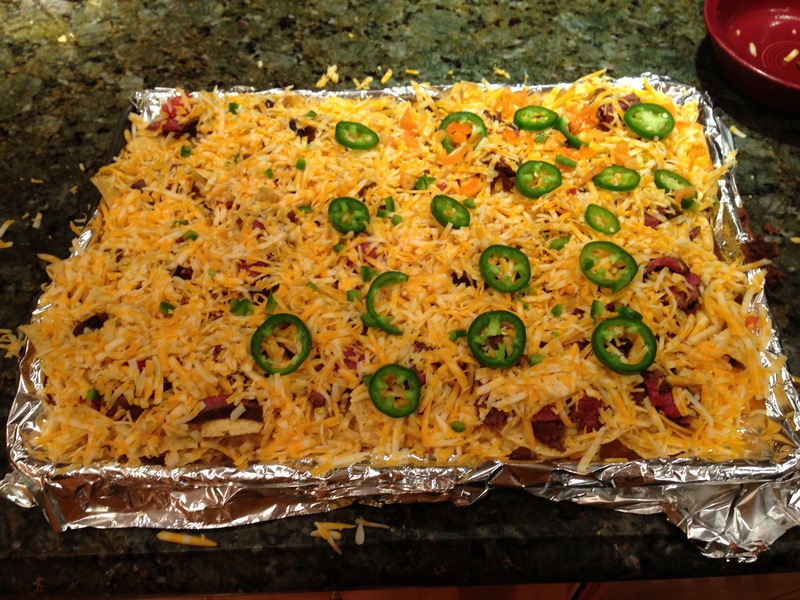 In an oven preheated to 425°F with the rack on the top rung, add your nachos. Let bake for 3-5 minutes until the cheese is nicely melted. Remove from oven and you can either serve it right there into smaller plates, or carefully detach the aluminum foil from the side of the pan and move all the nachos onto a large plate. Top with fresh tomatoes, cilantro, sour cream, salsa and guacamole and serve warm. Eat, be happy and watch a fun action film.